news The National Broadband Network Company has confirmed that Communications Minister Malcolm Turnbull has approved a further 150,000 premises to receive a full Fibre to the Premises network deployment, on top of the 300,000 premises where construction firms have already received deployment instructions. In the revised Statement of Expectations which Turnbull and Finance Minister Mathias Cormann issued to NBN Co in late September, the two Minister instructed NBN Co to complete construction of the NBN network to some 300,000 premises where construction had already begun using the all-fibre FTTP model favoured by the previous Labor Federal Government. “Management of existing design work should occur so as to optimise value in the context of the Government’s policy for a flexible architecture,” the two ministers added. Last week, in a move first reported by The Age and confirmed by NBN Co late yesterday, Turnbull’s Department of Communications wrote to NBN Co approving a further 150,000 premises for construction to commence. The move will have several impacts on the wider rollout of the NBN. 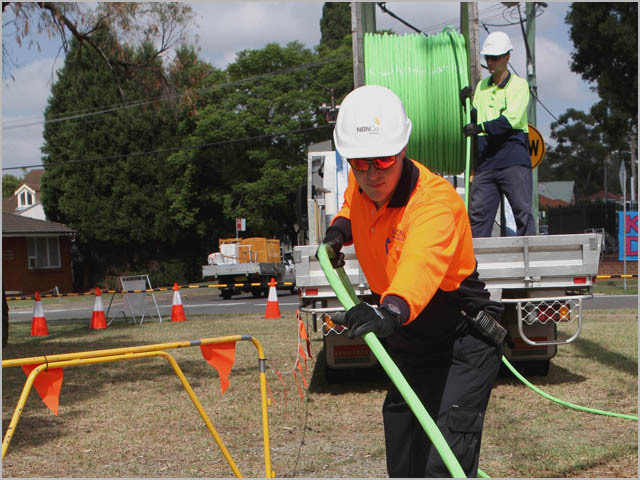 Firstly, it will slightly up the percentage of Australian premises which will receive the technically superior FTTP option for NBN broadband, instead of the Coalition’s preferred alternative models such as fibre to the basement and fibre to the node. Secondly, it may give construction firms working under NBN Co’s remit a degree of further work that may tide them over until the Coalition Government settles on the final model for the rollout of the NBN and gives orders for a new style of network rollout to commence — a decision which is expected to be fully made by mid-2014. NBN Co is currently conducting a Strategic Review into its operations and the future model for which it will deploy fast broadband in Australia, but any change to its network rollout based on that review is not expected to fully kick in until mid-2014, potentially leaving construction firms in the lurch for new NBN construction work. However, the possibility of a different style of rollout has been raised by Turnbull in the several weeks since the Liberal MP became Communications Minister. In late September, Turnbull appeared to have drastically modified the Coalition’s policy stance on the NBN just weeks after the Federal Election, declaring the Coalition was not wedded to its fibre to the node model and was “thoroughly open-minded” about the technology to be used in the network. NBN Co is currently conducting a strategic review into its operations and model that will inform Turnbull’s decisions regarding the project’s future. I’m going to be cynical here, and suggest that these 150,000 he’s “approved” are situations like where I live, and the areas are basically on the doorstep of being completed. Here in Wollongong, that means a little under 30,000 premises that were between zero and 6 months from being “NBN ready”. If so, the reality is that he hasnt really “approved” anything, only allowed the logical build be completed. I expect there will be several other “approvals” in the next 6 months as other areas in a similar situation hit that final stage. Again, the rollout map as it stands is deceptive, simply because its only capturing the final few weeks of what is a 13 to 16 month process. While I can understand the argument that the previous map was also misleading, this new one is worse. To me, this looks like he’s trying to get brownie points off the last remnants of the Labor build, and nothing more. Agreed. Another cynical view might be that this is just the Earl’s response to bad media about him stopping all existing FTTP activity. 150k isn’t much of a ‘loss’ to be fair – especially if they were just about done under labor anyway. Worryingly is if this is the case, then the Earl is obviously willing to let just about finished FTTP deployments be put on hold for FTTN over the top. But it irks me that the approval for FTTP now appears to reside with the department and not with NBN Co – and I don’t buy that this is an interim thing. That makes it very obvious that the NBN Co are now just an official entity of the current politic and we will get whatever is politically expedient and not value for money. Where’s that article on unusual procurement behavior in Government. I think you’re right on the money with your comment. There’s no reason not to have more categories to more accurately reflect the rollout status. I’m in an area that was previously labelled as construction to commence in November (pushed back from September), and while I accept that it may not have been close to construction, i still expect to know if my area is due to enter the planning stage in November (or whatever revised date). I don’t even know if I’m going to receive this connection for years, for all I know another area has been given priority over mine. MT will take the credit for this regardless… and his trusty little pawns here will be basking and praising him 24/7 (as usual…lol). So which are the further 150k households? So if the outcome of a review doesn’t matter, and he can simply approve what he likes, what is the point of pausing the NBN for a review? Why not just have FTTP for all? Why not just have FTTN for all? Turnbull, and this Coalition government in general, is the epitome of hypocrisy. The NBN rollout is not being paused … construction is going ahead on a massive amount of premises. No new work orders are being issued, sure (apart from the 150k), but it seems very likely they’ll be able to get FTTN work orders organised before the FTTP runs out. The plan from Turnbull all along was was for 22% FTTP. This extra 150,000 will not come close to making the total FTTP up to 22%. But it’s OK, VDSL2 has gone in the UK from an 11% takeup rate… to 10%. Albeit they’ve rolled out more, so that would drop it. Still. This many years into the rollout you shouldn’t be seeing this. So why have you applied the FTTP filter in your comment? Where did you get that figure from in your links? and once again the reports do not single out FTTC as being a problem. 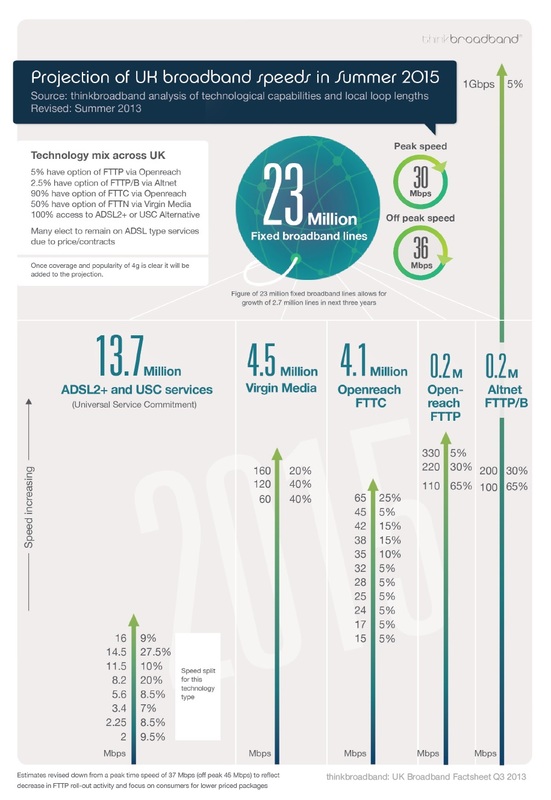 ThinkBroadband expects that even by 2015, it’ll be 95%+ FTTC and less than 5% FTTP. How about approving more than 150,000 connections? Which once again is for both FTTP and FTTC rollouts, you keep singling out FTTC which is your emphasis only on how you want it to look hoping no one will actually look at your link content and see what it actually says. …. and the problem with FTTC is? – or are you saying there is no problem anymore? Which has nothing to do with rolling out fibre investment per se but everything to do with the NZ regulator setting a to low a price for the copper and BB wholesale product sold by Chorus, affecting Chorus revenue. ” Sheldon said there was no evidence to suggest the combined wholesale price of a copper phone line and broadband connection should be lowered from its current level of $44.98 a month. Do you actually read the link content before you click on post? Does that mean every time there’s a problem with one of the few examples of successful FTTC deployments there’s left you’ll fall back on the argument that it’s the tiny FTTP component in those that’s the reason for the failure? And what I meant to say is that FTTP will represent, even until 2015, a fairly minute fraction of the total rollout. Although using your logic, it’s all good news. Since Telstra has been testing VDSL2 since a month ago or something, we can now blame, using your logic, every problem with FTTP on VDSL2. Can we do that from now on, you did after all effectively say we could? FTTP delayed by asbestos? It’s because they’re rolling out VDSL2! Incorrect, BT started the FTTP rollout in 2010 and started offering it in early 2011. So what that’s got to do with poor takeup on both infrastructures, as it seems most UK residents are happy to stay on ADSL2+ or consider fibre plans too expensive. That’s not my logic in the first place, I have never said we can blame FTTP problems on VDSL2. 95,000 vs. 12,500,000. But sure, if you want to continue implying that BT’s low 10% takeup is to any substantial degree attributable to FTTP, when about 99% of the rollout has been FTTC, then feel free. > That’s not my logic in the first place, I have never said we can blame FTTP problems on VDSL2. Well, you’re implying strongly that the problems in a 99% FTTC rollout are due to FTTP, so why can’t I do the opposite? > So what that’s got to do with poor takeup on both infrastructures, as it seems most UK residents are happy to stay on ADSL2+ or consider fibre plans too expensive. Given that we have fairly ubiquitous ADSL2+ here, why roll out VDSL2 then instead of just fixing ADSL2+ coverage? Honestly, I’d be in favour of the coalition putting together a plan to do that rather than going the VDSL2 way to spend money on an inevitable GPON upgrade both sooner and more wisely. Gotta love that endless Fibroid audacity eh? Is it hypocrisy or comedy…? Attempted head kick for the messenger and ignore the message, don’t you get tired of the same routine year in year out? Err, my point being that your message magically always changes to suit the argument and no matter how hard one kicks, the facts are never of any consequence to you, are they? For example (again) not so long ago BT/UK were, according to you, the epitome of FttN perfection, weren’t they? You gave FttP no credit at all for any of the so called positives you and MT provided, did you? But look…now that the BT/UK cracks have well and truly opened, you choose to blame FttP… seriously? So speaking of this, don’t you get sick and tired of your endless routine of contradictory, one-eyed, politically motivated, NBN FUD and baseless FttN syrupy, sugary sweet perfection? I didn’t blame FTTP for anything. The rest of your post is just unsubstantiated additional head kick material repetitive blah. Wow you’ve got new buzz words… “head kick”, good for you. Perhaps you could now add them to the answers you continually refuse to supply…? 1. So are you now admitting UK/FttN isn’t and never was the epitome and we shouldn’t use it as a measure after all? 3. Not if take up rates are important – are take-up rates important in the UK or only important in relation to our previous NBN, when they aren’t reached? 4. You’ve never blamed FttP for anything… Didn’t you blame FttP for us all being forced onto it and blame FttP because isn’t needed by everyone and also blame FttP for being a white elephant etc?… look forward to more pedantics and semantics over words now, to deflect…lol. Gee, what happened to the much vaunted “Australian FTTP Action Group”? Seems like it lasted as long as one of David Beckham’s fashionable haircuts. Are we back to wireless is the only way, the way of the future, yet? lol wtf are you talking about are you crazy? I see what Turnbull did here.. on one hand say that the previous completion stats were bogus, then proceeding to give the go ahead to 150k of them! that way he gets two headlines, one trashing labor’s rollout, and one promising the superior internet to 150k australians! This is just political grandstanding, plain and simple. If Turnbull actually had Australia’s future at heart, he would turn around and explain that labor’s idea was better, but he can roll it out faster. Then I’d have respect for him.